Hooflex Therapeutic Conditioner Liquid is an easy-to-use liquid that creates a breathable moisture barrier to help maintain a long-lasting moisture balance. 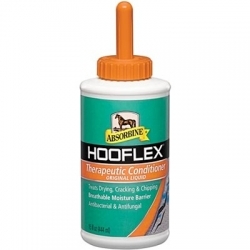 It is designed to condition the hoof, keeping just the right amount of moisture in the hoof for pliability of the wall, heel, sole, coronet, and frog. Comes in a 15oz. bottle with brush applicator.